The glissade of ticking and popping sounds had been faint, almost inaudible. If it hadn't been such a still day, Naiva would have thought it a trick of the breeze caught in the branches of a nearby stand of stunted juniper trees. Spear in hand, she studied the snow-draped land. A steep slope above them tilted dizzily toward the monstrous white summit of the mountain called Eternal Ice. The deep slash of a valley led down to where their large hunting party had been encamped since the new moon. All around, the high peaks of the Qal Sisma cut into the sky like so many jagged teeth. Dragons lazily glided in circles on the updrafts above the peaks. Dragons and humans weren't the only hunters in the mountains. She scanned the debris field of rocks in which the juniper grew. Nothing moved that she could see, but a few more quiet pops and ticks sounded. "Bai, goblin claws make that noise on rock." Baishya knelt ten paces away on an exposed outcrop of rock that stuck up above the densely packed snow field, which they'd walked halfway across. Head bowed, she raised a hand for silence. "Bai." Naiva kept her voice low. "We need to keep moving." "You're too impatient. My vision led me right here, I'm sure of it." "Yes, there is. You just can't see it." "I don't think you can see it either. You just say so to get Grandmother's attention because you're not as good at hunting as I am." Baishya looked back over her shoulder with the familiar lift of her chin and roll of eyes. Everyone in the clan said the two girls looked exactly alike, but Naiva absolutely knew for certain she personally never had that smug look of complacency on her face, not ever. "No matter how accurately you throw your spear and how expertly you wield a knife, you're no use as a hunter if you can't keep your mouth shut. Especially not to complain about me. You didn't have to come with me." "Someone has to keep you safe when you hear voices telling you to climb sacred mountains that are off limits to ordinary people . . ." Naiva broke off. A low whumph like a huge bear stamping a foot shuddered through the air. Cracks shot across the hard surface of the snow higher up on the slope. Baishya pressed her hands to her face as if a bright light was blinding her. "They're here," she said in a tone of awe, oblivious to the danger. The snow broke, starting to slide. Naiva plunged forward, dragged Baishya off the outcrop, and threw them down behind it. They flattened themselves into a slight overhang, backs pressed against the rock. The booming roar of the avalanche deafened them. Naiva flipped up her outer mantle of krushok skin, holding it open with her arms as snow cascaded over the outcrop and roared on down the slope. But it wouldn't be enough. The mountain was named Eternal Ice because its snowfield was so solid and stable, a holy place where hunters dared not hunt and only whisperers would walk when they were lured there by the voices of the ancestors. Yet now all the snow and ice of generations had broken, and it was going to bury them. Naiva did not fear death. But she was suddenly furious that Baishya was so determined to prove herself as a shaman that she had to drag her twin on a reckless quest. So they would die together as they had been born together, locked in a cold tomb. Baishya's hands began to glow with a greenish light. The sight so astonished Naiva that she forgot to be afraid. As the snow poured down, cascading over the top of the overhang, sliding around the curve of the outcrop, burying them in the ice of the ancestors, her sister began to mold and shape the crushing snow into a wall in front of them. The snow thundered against this barrier, bowing it inward. Naiva held her breath, thinking the snow would splinter and give way. But the magical wall held. The noise lessened. The rumbling faded into a pregnant silence. It should have been too dark to see except Baishya's hands were glowing with the eerie, wispy light. Naiva's voice had frozen in her throat. Her breath blew clouds of mist in front of her eyes, only it was not her breath. The wall dissolved into a white haze like the soft fall of a heavy snowstorm. Gauzy figures walked out of the snowfall. They were mostly human in shape: tall, slender, walking on two legs but not on the snow, rather on the troubled gusts of air rising from the catastrophic collapse. One wore a cloth the color of moonlight wrapped around its waist, speckled with darts of green like glowing eyes. The others wore wispy scarves as delicate as dew-laden spider webs. Instead of hair and beards, they had filaments growing from their pale flesh. These delicate string-like tentacles curled and waved in strange patterns. Baishya touched her own ears as if trying to muffle a howling clamor of multiple people shouting all at once. Naiva heard nothing, still deafened by the aftermath of the roaring sound or perhaps because she wasn't worthy; she couldn't hear what the elementals were saying, if they were saying anything at all. Baishya's eyes rolled up in her head and she slumped forward in a faint. They had coaxed them up here to kill and eat them! Naiva grabbed her spear. Baishya jolted forward and clamped down hard on her sister's arm. "No! Don't be stupid. The windfolk came to warn us, not to hurt us." As if her voice was a shattering blow, the elementals vanished into a thick cloud of snowflakes; or maybe that was just a concealment spell used to hide their retreat. "You can't just hit first and ask questions later, Nai! You have to listen." Baishya shook snow off her mantle and eased out from under the overhang. Her gasp of shock shot fear into Naiva's bones. She pushed out beside her sister. Naiva had always walked boldly where Baishya crept with hesitation. But even for Naiva this was too much; she gaped at the destructive path cut by the avalanche. Wide stripes and patches of bare rock had been exposed on the mountainside. Half the massive snow field had caved away, pouring into the valley to smother it in vast heaps of snow. "Grandmother and the camp are down there!" Naiva cried, imagining their broken bodies. But she didn't cry. Tears would not bring them back. "The windfolk told me. They called me up here to give me a message for Grandmother." She rubbed her eyes as if they were burning. "I have to tell Grandmother." "Not me? Don't you trust me?" "Why do you always make it about you?" "I don't always make it about me!" A faint boom sounded as another avalanche ripped away at an unseen slope. "Sound causes avalanches, too," Baishya added in a whisper. "As if I don't know that!" "Then why are you still talking?" Naiva bit back a retort. It was so annoying when Baishya was right, but she was right, and Naiva knew better to risk loud sounds where another avalanche might easily break. She grabbed her spear and the pack. They picked their way as quickly as was safe across the remains of the snowfield. The avalanche had hit the debris field full on, tossing stones farther down the mountain. Here they found the corpses of a small pack of goblins, smashed and smothered. "Told you something was stalking us," Naiva muttered. Baishya waved a hand for silence. An object scraped softly on rock. Naiva whipped around just as a squat, blood-spattered goblin leaped from behind a boulder right at her. Its claws raked for her head, but she slammed its torso with the haft of her spear and sent it tumbling. The tip of its claw caught on her leather shoulder plate. She used its momentum to flip it off her and onto the ground. It hit hard, feet scrabbling for purchase as it attempted to get to its feet. She was faster, with a cut to its hip to cripple it, in and out through tough skin and gristle, followed by a stab to the face. The first poke missed, and the point skittered on the rock. The goblin snapped at her arm, teeth catching on her leather vambrace. She stomped hard once, slamming its head back again, then circled her spear point back and skewered it with a thrust through the eye into the brain. Blood leaked brightly over the snow. She gave herself a moment of grim amusement that she had reason to be thankful for the avalanche. A single goblin was no danger to a hunter, but against so many she and Baishya could have been overwhelmed. Baishya had her knife out, kicking each of the crushed goblins to make sure there was no life left in them. Naiva wiped her blade clean in the snow, shook out their game net, and rolled the small bodies into it. "The tribe isn't starving, Nai. No one wants to eat goblin." "We are not leaving meat behind. Not with dragons so close." Dragging the laden net behind them, they slogged over to where stands of hardy juniper offered a more stable path down into the valley. Clouds of white haze were still billowing skyward along the avalanche's path. The dragons, taking it as a game, raced in from the distant peaks to breathe fire onto the heaps of snow. Meltwater churned down the valley's cleft in rising bursts of whitewater. "Even if they survived the avalanche, how can they survive such a flood?" Naiva whispered, heart cold. She hated being afraid. It made her angry. "The windfolk promised me." Yet Baishya's voice shook, no longer so certain. She reached for Naiva, and they clasped hands for shared reassurance. This was how it had always been: born when the midwife had cut open the belly of their dead mother, even then they'd been holding hands. The stream at the bottom of the valley had swollen into a rampaging river sweeping far past its banks and now brown with debris and soil and torn up vegetation. They could not descend directly into the valley lest they be swept up in the flood, so they took a longer route picking their way along the slope at an angle. "We could be moving faster if we didn't have to haul this dead weight." Baishya gestured to the lifeless goblins tumbled up into the net. "I say that to myself about you all the time!" Baishya laughed and stopped complaining, but in fact Naiva's mind was churning through every possible disaster. If Grandmother was dead, what then? Was it better to go to Ayagor, where there was a permanent encampment devoted to the feeding of Dragonlord Atarka? Or to join a new hunting band, one of the many that ranged widely through the vast territory of the Qal Sisma to find new sources of game? Or to journey to the borderlands where small hunting parties lived in defensible caves and ran patrols? She intended to survive, and that meant finding people who would take them in. People who wouldn't mind Baishya's absentmindedness when she burned a pan of roasting barley, or her dreamy staring at the sky when she was supposed to be scraping a hide. People who wouldn't just turn her twin over to Atarka once they discovered she was a shaman. Yet, what if Baishya was a burden heavier than the net of dead goblins? What if there was no group that would risk taking in a young, inexperienced whisperer whose presence could get them all killed? Could the two girls survive alone? Or would Naiva have to let her go? "Look there!" Baishya jolted to a halt, breathing hard. The waters had begun to recede, leaving the valley floor scoured clean of vegetation. Even trees had been torn from the ground and whirled downward to fetch up in teetering piles. A hill rose above one such heap of debris. Crowned with hardy fir trees, it had remained above the flood. People sheltered there, small as ants from this distance. By the time they trudged off the mountainside their legs were coated with mud and Naiva's whole body was aching. But a shout greeted them as they reached the hill. A sentry beckoned them in under the trees. Several fires were blazing as the big hunting party dried out. No tents had survived the scramble to safety, but the hunters had their gear. Grandmother was tending to several injured people. Her stern expression relaxed slightly as she saw them, but this touch of relief was all the emotion she allowed herself. "Naiva, what do you have there?" "A pack of dead goblins that were trying to sneak up on us." Grandmother nodded curtly. As always, she simply expected Naiva to have done the right thing without ever bothering to praise her. "Baishya, come aside with me." Naiva handed the net over to other hunters and followed Grandmother and Baishya into the trees. "What happened, girl? Some of the people are muttering that you going up the sacred mountain caused the avalanche. We barely escaped. Worse, this valley will take generations to recover. We've relied on the rich hunting here to feed ourselves now that Atarka demands so much meat." "You saw the windfolk? They haven't communicated with us since we bowed our heads to Atarka. I doubt they trust us now." "They gave me a message for you, Grandmother." Naiva leaned closer, hands curling into fists, shocked to hear Baishya speak that word. Atarka had banished the name Dragonclaw and eaten every person who had dared use the term in her presence. "Naiva, don't let anyone approach until she's finished." Grandmother grasped Baishya's arm. "Tell me everything." In the shadow of the fir trees the air felt colder than ever. An old skin of snow half circled the north-facing trunks of the big trees where the sun never reached. Baishya let out all her breath in a hissing exhale. Her voice got rougher as she slipped into a whisper trance, sinking back into the vision the windfolk had granted her. 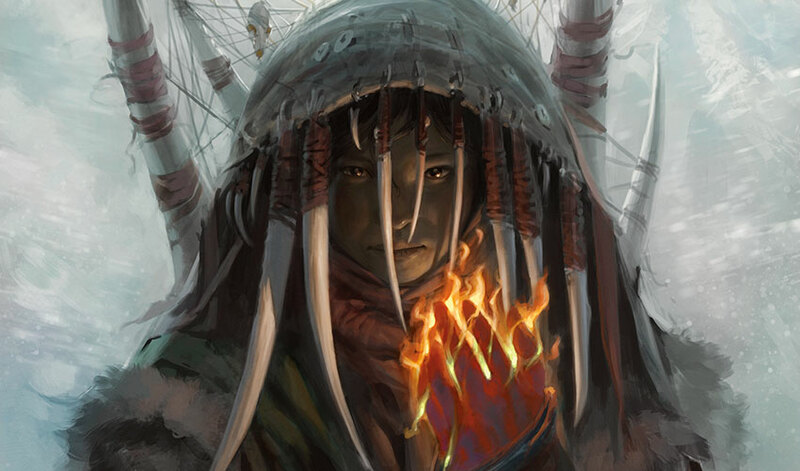 Naiva was no shaman, but she had always been able to sense vague aspects of her twin's thoughts. She too seemed to sink back into the midst of the killing avalanche when all the world was tumbling around them; however, it wasn't the memory but the vision through which they fell. There is a shadow, a great shadow. It is not clouds, nor is it night. Ripples sweep through the vast airy gulf of the sky. The shadow is a magnificent creature, terrifying and dark and powerful, and it is blind, or maybe it was born in a place of blindness and does not know how to see. Its wings beat storms through the heavens. Out of the storms fall giant egg-stones in different colors. Some plummet without ever waking, but the ones who wake uncurl as they fall and shake themselves in the wide vast gulf of the sky. Their wings unfurl, for they are not eggs. They are the children of the great shadow that lives betwixt and between, in a place and in no place. They are newborn dragons curled up into a ball, and they fall tumbling out of the sky in a flurry of ice and wings. 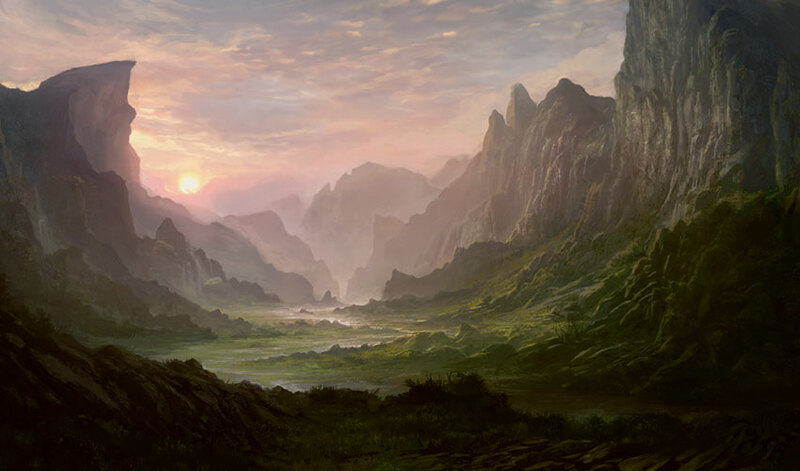 From one beat of the great shadow's wings, there fall seven such egg-stones onto a world that is not Tarkir, although there is no name for it in the language of the windfolk. First the brightest one uncurls. With the beat of pale wings, as it slows its descent, it opens its eyes and speaks: "Arcades Sabboth." By naming itself it takes control of its own destiny. No dragon would allow another to name it. Unlike the small beasts of the lower worlds, they always know exactly who they are. Then rises a dragon whose scales have a metallic sheen. His voice is measured and curious, as if surprised and delighted to discover he also has a name: "I am Chromium Rhuell. How interesting. What does this all mean?" A massive welter of reddish-green flashes outward to reveal spiral horns and a wild howl: "Palladia-Mors is my name! No one else can have it!" Two of the bigger egg-stones drop as if they are already dead. They crack into the hard ground and gouge impact craters into a mountainside. Soil and rock splash outward from each strike to make a ring of debris. "What is this place?" 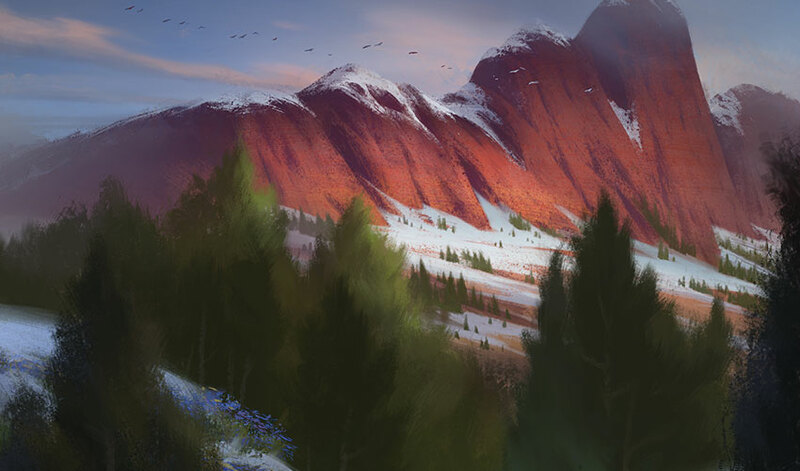 says Chromium Rhuell as he glides down to land a trifle gracelessly—he's still very young—on the peak of an isolated mountain rising in the midst of a vast plateau. The mountain is a smooth-sloped conical shape, symmetrical and pleasing, with a large crater at the top. He peers into the bowl of the crater but sees no huge broken egg. A warm wind rises out of the depths, hot and sulphuric. "Ah! What a pleasant heat!" He opens his wings, letting the sun dry out the dampness lingering on his still-soft scales. Craning his supple neck, he studies the landscape. The great shadow ripples across an expanse of forest and grassland toward a ridge of distant mountains. Sunlight returns behind its passage, gilding the scene with vivid colors. Arcades Sabboth alights beside him to bask. "Such a lot of trees everywhere around our perch. And look, there are all sorts of animals abounding here, some on four feet and some on two. Some are wild, and some have tamed themselves. They must all have names, just as we do. What is that assemblage of structures over by the river? It looks very orderly and interesting." The reddish-green dragon lands lower down to explore the fresh debris scattered by the impact of the two eggs into the mountain. She snorts in scorn at the shattered bodies lying broken inside. "These two were too weak to wake up. Good riddance." "Look!" Chromium gazes skyward. "There are two more!" Two small egg-stones tumble groundward, like an afterthought. Palladia-Mors grunts. "More weak, useless ones." She turns her attention toward distant grasslands where beasts graze in teeming herds. "I'm going hunting." With a huff of breath that almost kindles to flame, she launches herself into the sky. The slope of the mountain cuts off the trajectory of the last two egg-stones. Losing interest in the lost egg-stones, Arcades sweeps out his wings and flies toward the assemblage of structures. Yet Chromium Rhuell can't help but wonder what has become of the last ones, these younger siblings, especially when no tremor of impact shakes the ground. When he circles the peak, he sees nothing on its lower slopes: no impact crater, no freshly born dragons flying, nothing. Just a dense growth of trees cut through here and there with meadows. It's as if the other egg-stones dissolved, and maybe they did. Maybe they were of no more substance in this world than the Ur-wings that birthed them and fell back into the realm of blind shadow. He wonders what Arcades is up to and if he should go after him, then notices another egg-fall in the foothills of a far distant mountain range as the great shadow's wings make another beat: "More egg-stones falling! Cousins!" Intrigued, he flies away to seek them out. So he does not see the tangle of wings that unfold just before impact. The sixth egg-stone unfurls into a startled green dragon just before she crashes down into a clearing at the base of the mountain and rolls several times. Her clumsy landing surprises a party of hunters who, with nets, iron-tipped spears, and lean, ugly dogs, have just brought down a large carnivorous beast. Its blood is still steaming, fragrant and warm, and so the hunger consuming her belly is her first thought. She roars to scare them away. "I am Merrevia Sal. Give me the meat, or I will kill you." The startled hunters and their dogs are so over-awed by her unexpected ferocity and shattering roar that they do not notice the last egg-stone. It unfurls into not one, but two small dragons born twinned together. Not twenty paces from the clearing they hit the canopy, crashing down through branches and, with twin thumps, come to rest on the forest floor amid a welter of needles and fern. "Of course it's my name. Hsst, quiet, Ugin. Look out there. What kind of greeting are they giving her? I don't trust them." In the clearing Merrevia Sal roars again. The hunters back away from the beast they've killed. She is big compared to the bipeds, but when she lunges forward toward the carcass, her right wing drags a little. The fall injured her. The hunters exchange looks like speech. With nods and gestures, they fan out. Something about their demeanor has changed. They are still cautious and fearful, but as she gorges herself they slowly move to encircle her with a form of lesser cunning, sly and cowardly. When she raises her head to cough warning smoke at them, they fall back; when her attention returns to her meal, they creep forward again. "Stay still." Ugin starts picking at the debris with his foreclaws and mouth, trying to pull it apart without upsetting the entire heap into a crash that will draw attention to them. Nicol can't look away, gripped by a confusion, a frenzy churning in his gut: the blood and the anticipation swell like hunger; how dare these small, weak bipeds assault one of his own? The hunters fling a large net over her head. With a howl of surprise she thrusts upward, to fly. The hunters cling to the ends of the net, and at first her sheer staggering strength hauls those who can hold on right up off the ground, their feet kicking in the air. As she tops the nearest trees the net tangles so thoroughly in her wings that she loses her lift and flails downward. She crushes one hunter when she lands on him, thrashing and roaring. She bites at the rope, but now her damaged wing is also caught in a branch and she can't maneuver. Dogs bark excitedly, nipping at her flanks as she twists. "Hurry up! We have to help her." says Nicol. "Quiet. If they see us, you're trapped and at their mercy." Nicol hisses. It's true they can do nothing as long as he's trapped. It's maddening. It's wrong! With a cough of stinging sparks she drives back the first attack. Her scorching breath drives two hunters to their knees. They shriek in pain as burns whiten their skin. The others fall back. One among them shouts orders, and again they rally, again they ready their spears. They attack from all sides, yelling loudly, goading each other. She claws the belly of one right open, guts spilling in a mass of ooze and stink. But his death gives the leader an opening to duck in on her other side and plunge his spear deep into the still-soft scales of her underbelly. Hot blood pumps out from the wound, spraying the leader from head to toe in red. She flops sideways, her caught wing tearing with a horrible ripping noise. Another hunter goes down beneath the bulk of her twisting body, but now her head is vulnerable. Two hunters thrust into her right eye. Dogs lunge for her open belly, scrabbling to dig deep and pull out her soft viscera. Yet still she struggles, still she fights because she is a dragon, and dragons never bow before lesser creatures. She crunches a dog between her teeth. Left side dragging, the two spears still wobbling from her eye, she pulls herself into the trees, seeking escape although there is no escape as the surviving hunters, including the leader clad in her blood, pursue her. Nicol is still stuck. He opens his mouth to roar fury, but Ugin clamps talons over his muzzle, smothering him. "Hush." Fortune favors the two young dragons this day: the hunted leads the hunters away from them. But they hear the shouting and the frenzied barking. Almost lost between all the noise comes the dragon's weak cough as she tries to burn them. There's more thrashing, a howl of pain, agonized yelps, a mortal scream. "Hurry up, Ugin!" says Nicol. "It's not too late. She's still killing them." "Kick with your right rear leg." Nicol kicks, dislodging a weight. Impatient, Nicol surges forward, scrambling over a tumble of rough-barked limbs as the rest of the debris slides away onto the floor. As he and Ugin bolt into the clearing littered with the corpses of five hunters and three dogs, a chorus of triumphant shouts splits the air. The odor of mortality cuts like a gust of wind through the trees. The death of a dragon smells like honey. Its sweetness is its power, although these hunters don't know that yet. "It's too late," sighs Ugin. The heat of anger boils up from deep in Nicol's heart. He will burn them. Burn them. Ugin grabs his right rear leg and tugs him to a halt. "There are many of them and only two of us. We are smaller than our sister." "We can do nothing for her." "We can avenge her. These puny creatures cannot be allowed to attack us." "We must find the others first. Safety in numbers, as the hunters had. Not one of them could have taken her alone." "Other dragons who fell with us. Our siblings. Did you not notice them?" Nicol looks at the cloudless sky and the dizzyingly brilliant sun. The sun is magnificent, bolder and brighter than anything else, dazzling and powerful, the antithesis of shadow and fear. "I am not afraid of the hunters," he says, sure that the sun fears nothing. Ugin is young but clever. He sees that to argue will gain him nothing. "Come, Nicol. Let us climb to the top of the peak and see if we can spot our siblings." Nicol is not going to admit he did not notice any dragons except Merrevia Sal. But more than that, he despises running away like a fear-struck weakling. Yet the dogs have started barking with the fierce yaps that mean they have caught a new scent. The hunters are puny, true, and their sister killed five of them already, but they've proven they can work together to accomplish a task that would be impossible for anyone alone. 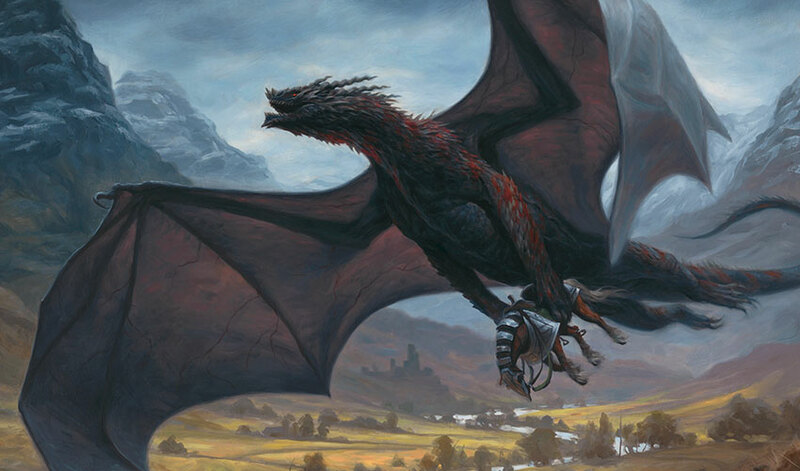 Ugin takes an awkward running start and jumps with a flap of wings, then thuds down onto the ground. It would have been funny if they weren't about to be set upon by emboldened killers. "I can do it," says Nicol. The chorus of frantic barking intensifies as several dogs race into the clearing. A kick of adrenalin surges through him. He leaps forward onto the lead dog and rips its head off with a single bite. Salty blood saturates his mouth. He chomps several times and swallows. It would taste better if he could savor it, but teeth nip at his flanks as other dogs race around him, snapping. "Only fools mistake prudence for cowardice." Annoyed because Ugin is right, Nicol swipes with a claw in a big circle, driving back the dogs. More break through the bushes at the clearing's edge. The hunters' voices are getting louder. When he pushes off with his rear legs and flaps his wings he rises faster than expected; even so, he's still awkward. His lower clawed feet brush across the pointed crowns of fir trees. He barely flies out of the clearing without getting tangled in the trees again. But he is out, away from the hunters, some of whom have now run into the clearing. They stare up after him, no doubt in awe. As he rises above the forest, he starts flying toward the peak. He looks back, suddenly worried. Ugin has vanished. "Over here!" His twin has passed him already. They race to the summit and land in a welter of wings. Nicol wipes blood from his muzzle onto his forelegs. The blood is already cooling and congealing, but the pound of his heart is still going strong. How easy it was to rip the animal's head from its neck! He could have torn through all the dogs because their teeth can't penetrate his scales. It is the hunters who are dangerous, with their weapons and the way they work together to achieve something they cannot do alone. Then he sees the nearest impact crater and inside it the body of a dragon, much larger than either he or Ugin. It did not survive the fall. "Which death is worse?" he asks. "Never to waken, or to waken and live your few moments in a frenzy of fear and fighting?" Ugin does not reply. He stares all around at the landscape. The world is not new, but they are new, like infants whose eyes cannot fully understand what they see: green forest, yellow-green grassy plains, the silver threads of rivers winding their way across a wide plateau. All sorts of creatures wander this wide world. Everything waits to be discovered. Ugin shifts his gaze upward and for the longest time stares at the heavens above. "Where did we come from?" he asks. "Where did our progenitor go? What lies beyond the sky?" "I see one!" Nicol spots a dragon swooping low over a herd of animals. It's exhilarating to watch the prey scatter in fear. The dragon snatches a running beast with such grace and power. 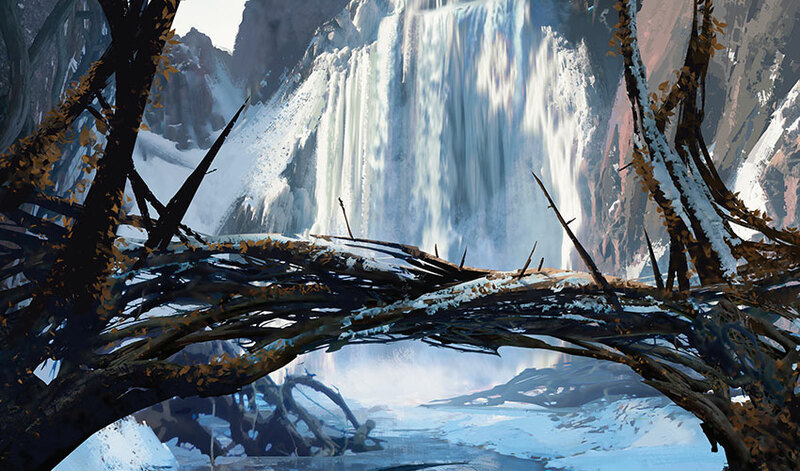 The yapping still sounds from below as the dogs find the forest debris where he and Ugin landed. When he thinks of the dead sister, he wants to tear all the hunters and dogs to pieces, but maybe the fault doesn't lie with them. They just took the opportunity to get something they wanted. Maybe the fault lies with the dragons who didn't survive. He can still hear the death howl of Merrevia. Dying isn't wonderful. It's bad. But being the hunter: that's a better thing. He climbs to an outcropping that will allow him to drop into an updraft; he's already getting a sense for this world, for the way invisible winds and currents can help you find your path. Before he launches, he halts, feeling the lack of his twin's presence, and turns back. Ugin hasn't moved. He's still staring dreamily at the landscape. "You fool," says Bolas, "we have to keep up with the others. Warn them about the hunters. Learn how to find our revenge. Hurry!" Ugin turns a calm gaze toward Nicol. His eyes are like crystals with depths that give way to mysteries. He says, "Someone is looking for you, Yasova Dragonclaw. Come to me." A shout of warning broke through Baishya's raspy voice. Baishya blinked wildly, swayed as the vision left her, and collapsed into Grandmother's strong arms. Naiva grabbed her spear and ran for the edge of the trees. Three dragons had landed at the edge of the makeshift camp. They were Atarka's broodlings, with stocky bodies and antlered crests. The two big ones huffed threatening curls of flame, but like most of Atarka's brood, they hadn't much in the way of a mind to think with. The smallest, however, had a look of cunning in its fiery eyes. It spoke only Dragonspeech, expecting them to understand. "We smell magic in the air. Surrender your shamans to us, or we will kill you all." Naiva's pulse raced, and her mouth went dry. She tightened a hand on her spear as she exchanged glances with the uninjured hunters, all of whom stood, like her, with spears held upright at their side—meant to look unthreatening, they could defend at a moment's notice. 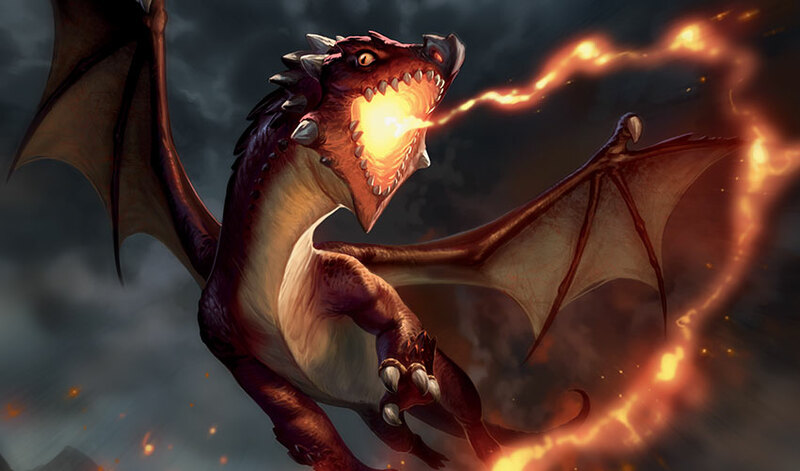 And yet to defend meant attacking the dragons, and such an attack would cause a war between Atarka and the clan. The humans could not win this war; that's what Grandmother had understood eighteen years ago. Was it better to die fighting or to live cringing? "What heralds have approached this humble band?" Grandmother emerged alone from the trees. She carried no weapon; the dragon claw staff that had once announced her position as clan chief had been hidden deep in a secret cave, guarded by concealed whisperers. A fake one had been carved and given to Atarka to destroy. But Grandmother was weapon enough in her own presence. If she feared anything, Naiva had yet to learn what it was. "I am Yasova, First Mother of this hunting band. Do you have a name, honored broodling?" The broodling spat a tongue of flame harmlessly onto the ground. "A big snowfall tore the ice and snow off the mountain. How are you not dead in the snowfall? Torn apart like the trees? We smelled the foul odor of magic. This work is forbidden to you by order of Dragonlord Atarka." Grandmother gestured toward the firs standing straight and tall behind them. "We camped upon this hill," she lied, for anyone who knew anything about camps or had half a brain could see there was no sign of firepits and temporary shelters. "The avalanche and flood passed below us. We ask your permission to continue our journey." The dragon blinked once and then a second time as thoughts crawled across its slow mind. "Where do you go?" They had been planning to stay a full cycle of the moon in the verdant valley before returning toward Ayagor, so Naiva was surprised at Grandmother's next words. "We have been assigned by our hunt caller to patrol the eastern range of the Qal Sisma against the incursions of enemy clans. We'd like to keep traveling while there is still daylight. For your trouble, and out of respect, we have gathered a little snack for you." She caught Naiva's eye and lifted her chin in the direction of the net. 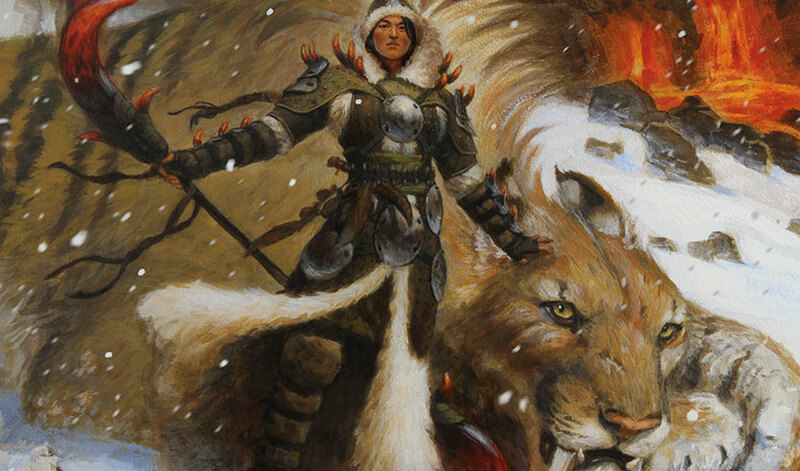 With the help of one of the other hunters, Naiva dragged it forward and shook out the corpses onto the rocky slope. The two big dragons snuffled eagerly, looking toward their leader for permission to eat. Even the small one was distracted by the offering of an unexpected treat. They were a greedy lot, and their hunger was their frailty. As they tore into the goblins, Grandmother drew everyone back into the shelter of the trees. "Make ready to move," she said. "The injured who cannot move must remain here with supplies until we can return for them." "Where are we really going?" asked Naiva. Grandmother gave her an impatient look. "You should already know." Naiva's cheeks flamed with humiliation. Fingers brushed her sleeve, and she turned to find Baishya beside her, face flushed, as with a fever. "Didn't you hear, Nai? The vision was passed to me by the windfolk but it didn't come from them." "Who did it come from?" "From Ugin, the Spirit Dragon." "Ugin is dead. Grandmother was there and saw him die. She's told us that story a hundred times." "Yes. That's why we have to go to Ugin's grave. We must find out what this vision portends."